On my wall, I have this pretty cool (even if I do say so myself) poster! 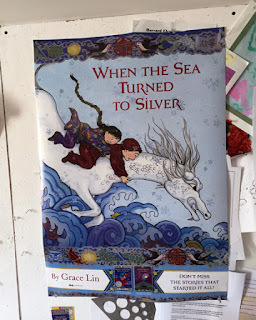 My publisher revealed them to me at last month's ILA conference and I was kind of blown away. So much so, that I asked if I could have a bunch of them. They kindly obliged and I am thrilled to say that every goodie bag at my upcoming launch party will have one in it! Doesn't that make you want to come to the party? Save the date!!! Not local? I'm reserving some for an online giveaway...so stay tuned for that, too!